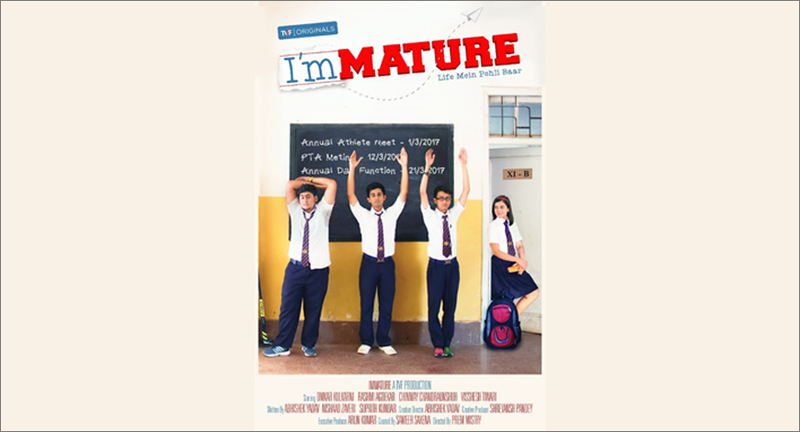 ImMATURE, a yet-to-be released web series by The Viral Fever (TVF), has earned its place among the top 10 digital series globally at the first edition of the Cannes International Series Festival -- CANNESERIES. ImMATURE is the only Indian selection for the fest, which is being held from April 4 to 11 2018 at Cannes, the mecca of creativity. ImMATURE has been created by Sameer Saxena of Permanent Roommates and Tripling fame. It has been written by Abhishek Yadav, Nishad Jhaveri and Suprith Kundar, and directed by Prem Mistry (who was part of the team that made TVF Pitchers, Permanent Roommates and Barely Speaking with Arnub). The cast comprises young talents Omkar Kulkarni, Rashmi Agdekar, Chinmay Chandraunshuh and Visshesh Tiwari, with appearances by Nidhi Singh, Nidhi Bisht, Jitendra Kumar and Biswapati Sarkar. ImMATURE is a comedy-drama. Growing up is tough and ImMATURE is about all that. Peppered with incidents that each one of us can relate to, ImMATURE is a five-episode coming-of-age story about the first adventures in a young man’s life. Dhruv is 16, and in a hurry to grow up. With a little help from his school friends, Kabir and Susu, Dhruv sets out to woo the first crush of his life, the feisty and out-of-his-league class topper Chhavi. Venturing out of their childhood, in their last years of school, the trio find their first drink, pick their first fight and mend their first broken hearts. CANNESERIES aims to highlight series from all over the world to give an international voice to this increasingly popular and much-loved new art form. The competition will take place on 11th April, 2018. Prior to this, TVF’s ‘Truth or Dare with Dad’ has been awarded the Most Popular Video at WebTV Asia Awards, 2017. Its Pitchers won the Best Screenplay at Marseille Web Fest, 2016 and Tripling won the Best Screenwriting for a Web-Series at Asian TV Awards, Singapore, 2017.